Star Products is happy to introduce a portfolio for "Kids". Yes, it can be used for adults who still have the little kid in them and the adult who wants to keep their child's precious memories. The Student Art Folio is addressing the need for children to carry, transport & store their projects, memories, and homework assignments in an attractive portfolio made just for them. For years, children have had to "make do" with whatever they were given. Now they can personalize their own portfolio & store all of their valuable memories. Each portfolio comes ready to be personalized. 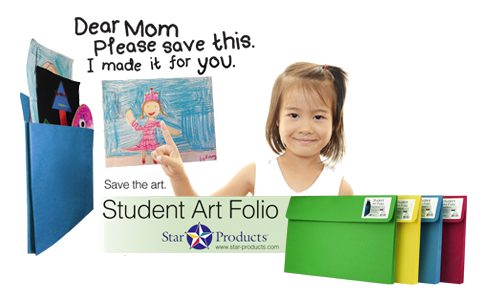 The Student Art Folio will provide years of lasting memories for kids of all ages. All 4 sizes will fit "Mini" display rack.